I have a secret to tell you. I'm overwhelmed. I have a lot going on and I'm finding it hard to stay on top of things. Which leads me to the bad news: I'm taking a blogging break. Today's post will be long-ish, and then I won't post again until possibly next Wednesday (2/27). If I get a spare moment between now and then, maybe I'll post a little something-something, but I'm allowing myself this break to enjoy my mini-vacation (more on that in a sec) and to get organized. I hope you all don't mind. Stressing about trying to find the time to blog this week is wearing me down, and I know it will only become more difficult. We've all been there, right? Okay, well, that's all the depressing stuff I have for you so on to the fun stuff! I guess I'll give a quick weekend re-cap. PS - There aren't any weekend pictures. That's just the kind of weekend it was. Plus, I've been to Philly so many times that there's nothing I need to take pictures of anymore. Friday: Sat around ALL day because E had to work from home. We were planning on leaving for Philadelphia in the late-ish afternoon. Well, ish happens, and so we couldn't leave until 7:00. Yep. At night. We drove to Philly, checked into our hotel, found a place to eat (The Perch Pub. I suggest you check it out if you're ever in the area. ), and crashed. Saturday night we got all dressed up (not really, but I did wear a dress) and went to this really nice Italian restaurant for dinner. The portion size of my homemade linguine with creamy bolognese sauce was out of control. I couldn't finish it, and I almost had a heart attack because I was so upset that I couldn't box it up and take it with me. That's what happens when you get a hotel room with no fridge. Ugh. Sunday: We were up and out of there pretty early. E's stepmom's birthday party was back home at 1:00. We were a little late, but we made it. It was a super fun day all around. Oh, and if you were wondering, the party was at the Duck Pin Bowling place. Awesome. We stayed there until about 4:30ish. Then it was home to relax for all of five minutes. E and I decided to go see a movie. The theater where we live was (is?) still playing Argo, even though it came out on DVD yesterday. Crazy. I must admit, I loved it so much that I am planning on buying it. Soon. It's one of those movies that gives you insane anxiety, though. This, of course, is not so good for someone like me who already has insane anxiety. But I survived. My survival of the movie was celebrated by my going home and immediately falling asleep on the couch. Does anyone else feel like you sleep better when you fall asleep on the couch before actually going to bed? No? Just me? Monday: As you may know, Monday was Presidents' Day. NO WORK! I went to my parents' house to do some laundry and get stuff together for my trip to Florida this weekend! Then I made a really disgusting dinner that we won't mention again and went to bed. Now here we are. Wednesday. My day so far has consisted of eating a blueberry muffin with a spoon and making lots of lists. I cannot wait to go home and pack. E and I are leaving tomorrow night; our flight is at 8:00. Friday morning will be waking up in 80 degree Florida! Saturday is my mom's birthday, and you might remember that she is currently vacationing by herself for two months. She is loving every minute of it, but I still couldn't let her be alone for her birthday. And with my not working on Fridays... you get it. This mini vacation is also one of the main reasons for my blogging break. I have too much to do between now and then, and I highly doubt that I will have time over the weekend -- between bars, the dog track, more bars, the pool/beach, and birthday celebrations -- to be in front of a computer long enough to write anything. And I have been too busy to pre-plan any posts. Sorrynotsorry. Valentine's Day theme for this month. Sorry for the not-so-great quality. This was taken with my good camera, but the room had to be dark to show off the lights we got to put inside the shelves. They change colors! ﻿I made the Valentine's Day picture in the frame, and I bought the heart-shaped bowl at Target (dollar section, heeeey!). The corner is complete with a basket for my yarn, cute pictures and garland, and the most comfortable/cute papasan chair ever. I'm so happy! As for next week, and why I won't be posting again until Wednesday, simply put: I'll be busy. We land at 8:00 p.m. on Sunday and I will probably just want to get ready to start my week. Monday night will be spent at Verizon finally upgrading my phone (iPhone 5, here I come!). Tuesday night may be filled with music by the wonderful Scott Miller, who will be playing at Hill Country DC. I've never been, and I NEED to go. Hill Country DC is like a small Austin, TX practically in my backyard. There is nothing better than that. Except maybe the real Austin. Oh well, I'll take what I can get. Now begins my blogging break. Thanks for understanding. But I will leave you with a picture of my little girl, Henrietta, wearing her Valentine's Day attire. And also winking...I think. Your trip to Philly sounds like it was fun! Hope you're having/had fun in Florida too! 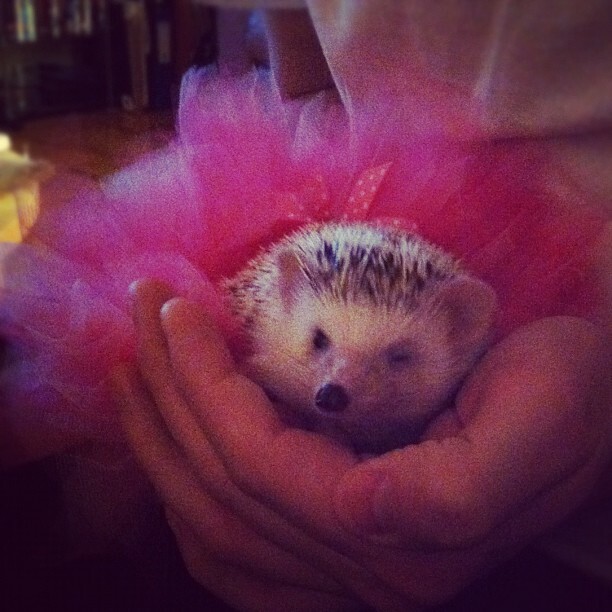 The picture of Henrietta in the tutu is ADORABLE! Holy crud, your little Henrietta is ridiculously adorable. I want one.